A World War One trench system has been recreated near Ullapool as part of a school history project. P7 pupils from Ullapool, Lochinver, Achultibuie, Badcaul and Scoraig primaries in Wester Ross are involved. The trenches were dug in a farmer's field before features such as wooden boards, steps and sandbags were added. 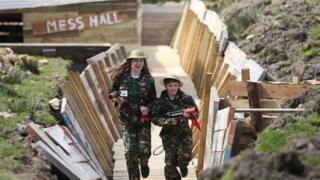 The pupils, who have been researching a book written by a war widow in 1918 called The Men of Lochbroom, have also had a "battle" using laser tag guns. Veterans charity Outpost has been working with the schools project, called The Men Of Lochbroom Through The Eyes Of The Children Of Lochbroom. The trench lines were dug by machine. Building the trench features took 13 days, with Ullapool High School teacher Jemma Middleton, Carl Burns and a local volunteer, Jack Maclean, working 15 hour-long days to complete the trenches and "battlefield". Other volunteers helped out when they could. Heritage Lottery and Historic Environment Scotland has provided funding to the project. A community open day is to be held at the site on Sunday. She said: "The students found it very frustrating that they couldn't just run around and hide behind things which gave them a real understanding of what the men faced and were shocked by this." She added: "We are also holding a recreation of the Christmas Day truce football match on that day which will see the local men's team take on the children's team played in no man's land." The battlefield is to be made available to other schools. Twenty bookings have been made already from schools as far afield as Glasgow.